Start your trip to Hobart today by reading the most recent travel tips, major places of interest in the city and smart advice to make the most out of your trip. Hobart is the capital of the State of Tasmania, Australia’s only island state, known as the Apple Isle – just look at its shape! The Hobart area was one of the first major settlements in Australia, established in 1804 as a convict colony in the days when the island was known as Van Dieman’s Land. Later, it was made a city and named after the Colonial Secretary, Lord Hobart, in the 1840s. Today, the city is possibly best known around the world as the finishing point for the famous Sydney to Hobart yacht race, held in December (starting on Boxing Day) every year. Hobart is also home to Wrest Point, Australia’s first casino. Hobart prides itself on its superb food products. It is the centre of a rich primary production area and the many fine varieties of honey and cheeses, as well as dairy products in general, are of the best quality. It is particularly renowned for its variety of seafood. Many consider Tasmanian salmon to be the world’s best. Its wine industry is also growing year by year and produces wonderful cool climate varieties. 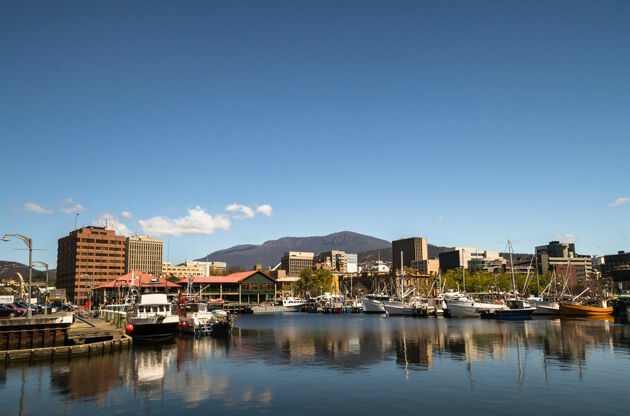 Although somewhat less accessible from other Australian capital cities, Hobart has a thriving cultural scene and hosts numerous festivals - particularly those connected with music – all throughout the year. The city has also become famous for producing Mary Donaldson – now better know as Her Royal Highness, Crown Princess of Denmark. Errol Flynn was also born in Hobart but whether Merle Oberon was or wasn't will probably remain a mystery. The city is on the southeastern coast of Tasmania and lies on the Derwent River estuary – a deep-water port and the former site of extensive whaling and sealing operations in the nineteenth century. From the city the backdrop that dominates the landscape is Mt Wellington, which is the highest peak in the state and, in winter, is snow-capped. Hobart International Airport is just 17 kilometres from the city and easily reached by shuttle bus or taxi. The city is small and easy to explore on foot. The bus network is efficient and affordable. Hobart is Australia’s second oldest city and there are traces of its early history everywhere. You can climb Kelly’s Steps, built in 1839 by James Kelly, an explorer and Hobart port official, to reach Battery Point, which is situated on the cliffs above Salamanca Place and has traditional and attractive homes, shops and cafés. The Art Gallery and the Museum record the interesting history of the area and hold a fine collection of early Australian art and artefacts. ‘Must-do’ visits include the Cascade Brewery in South Hobart and, to the north of the city, you can tour and enjoy tastings at the Cadbury Chocolate Factory – the biggest manufacturer of chocolate in the southern hemisphere. Some of Hobart’s best shopping areas are on Elizabeth Street, in an arcade strangely called ‘The Cat and Fiddle’ (you’ll see them on the wall) and in a range of specialist shops and boutiques in trendy Sandy Bay. On Saturdays, Salamanca Place is even livelier and more colourful than usual because of its famous market. It’s a good place to shop and eat every day and you’ll find a great selection of local products and tasteful souvenirs. Native Huon Pine products and the absolutely delicious Tasmanian honey are very popular with visitors. Tasmania is a gourmet paradise and Hobart loves to showcase the best the state has to offer. Its seafood is a specialty and for good reason. It comes straight off the boats in the Constitution Dock and Victoria Dock areas. There are many great places to eat wherever you go in Hobart. Visitors love the traditional pubs and, for fine or casual dining, with a strong focus on seafood, Mures on the docks is a favourite. Hobart is not the nightlife capital of Australia but there is a selection of nightclubs and plenty of smaller bars and taverns that offer the same range as most cities, depending on your preferences. The truth is that you can take a day trip to anywhere in Tasmania, although you will invariably want to stay longer. It is always a tremendous experience to take a Derwent River cruise from the docks. Port Arthur is the carefully preserved site of one of Australia’s main convict settlements. It is one hour’s drive from Hobart and gives a comprehensive history of the period. The Huon Valley, surrounding Hobart, is a great way to enjoy Tasmania’s natural beauty and the World Heritage Area in the southwest is not to be missed. Historic Richmond is a fascinating small town – either as a day trip, or a stop-over on the way north. Then there’s Launceston, the northern beachside towns, Cradle Mountain … the list is endless. Hobart welcomes a large number of global congresses, conferences, symposiums, fairs and trade shows ever year. With high tech equipped venues and comfortable hotels, the city makes a great place for these sort of gatherings. In addition the availability, city's natural beauty and rich offerings help the attendee to get the maximum of a business trip to Hobart.